Ever since moving into Kaiju! 's brewery as house guests, Frase and Grum of Exit Brewing have had rather more tank space in which to play. They took the opportunity to start releasing beers that would form their core range. After releasing 12 bottled beers in numbered fashion, only repeating one and even then with a different recipe, the plan changed: they've continued with the numbered releases but now have a small number of beers that will always be available. And, while we've always been fans of their saisons – beers #001 and #006 to date – it was with hops that they kicked off their core range, perhaps unsurprising given that most of the other beers in that dozen were pale ales or IPA variants. 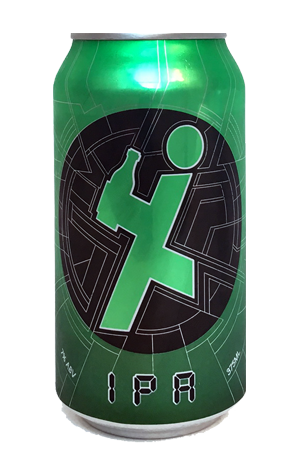 They are hops that come in the form of an IPA, one that's typically bold and Exit-like: based on their intensely hoppy West Coast IPA but toned down a little (but only a little) to 7 percent ABV. It pours a hazy deep golden, fires out heaps of lean grapefruit and citrus aromas and has a little malt sweetness holding things in place before signing off with a lingering, drying, resinous bitterness. A big beer with which to launch a core range – little wonder they moved in with Kaiju! UPDATE: As of February 2018, the beer is available in cans as they transition all of their core range beers across.